This Post has already been read 532 times. 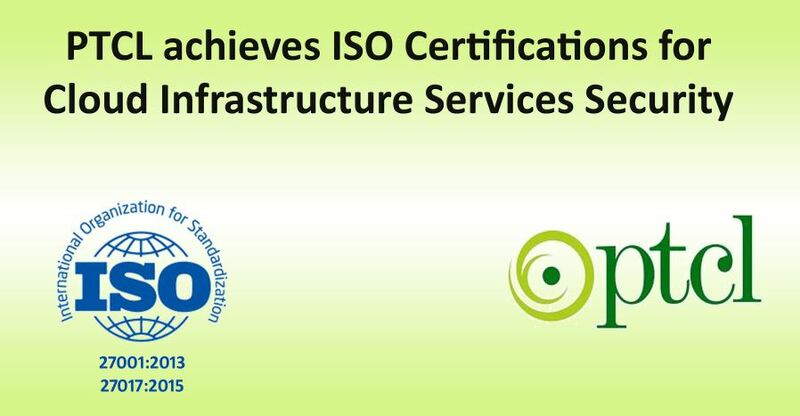 PTCL has become the country’s first telecom operator to achieve two ISO certifications in parallel for its cloud services ‘Infrastructure-as-a-Service’ (IaaS) offering. These are ISO/IEC 27001:2013 and ISO/IEC 27017:2015. The International Standards Organization (ISO) and International Electro technical Commission (IEC) are the authorities for these standards. The ISO 27017 is a Cloud security-specific standard, while ISO/IEC 27000 is a family of standards that helps organizations keep information assets secure. PTCL’s cloud offering allows our customers to utilize the amount of computing resources as per their requirements on an OPEX model without having to invest in hardware themselves. Addressing the specific needs of cloud security, ISO/IEC 27017 builds upon ISO/IEC 27001 – providing additional controls and implementation guidance on architecture, technology and processes to ensure information security is well protected in the cloud. Recently PTCL also announced Payment Card Industry Data Security Standard (PCI-DSS) Level -I certification v3.2 for its Infrastructure-As-A-Service (IaaS)/ PTCL Smart Cloud offering, which assures maximum security compliance as per international standards.